Mesh protective mesh proposed E. N. Pavlovsky to protect your face from blood-sucking insects (mosquitoes, mosquitoes, grapes). This is usually the piece of cotton bredneva mesh size h cm with cells 12x12 mm, covered on the edges of cotton braid. 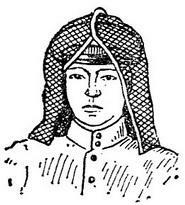 The protective net strengthen the headdress with pins or straps so that it freely hanging from the front to the level of eyebrows and closed the neck with the sides and back (Fig). Pre-treated mosquito repellents (see) protective grid distributes smell deterring blood-sucking insects. The protective net RUB ready repellent bars in the form of bars of soap or toothpaste on fatty to a basis, produced in tubes. In the absence of finished compositions used for impregnation of safety nets apply repellent jellies. For cooking jelly dietilftalat 1 weight part of acetate (you can replace washed in hot water, dried and chopped non-flammable film) dissolved in 10 parts of acetone and add 4 parts dietilftalat. The net dipped into the jelly and dry. If this way of handling the mesh retains repellent ability to 2 weeks. The most universal repellent for impregnation grid is diethyltoluamide (DETA); after the soaking DEATH metal mesh can be used without additional processing to 4 weeks. When using only treated net is recommended to avoid contact with her face and neck and, if possible, not to wear her first 3 days more than 2 hours per day. To keep the grid in the case of a polyethylene film. There are similar nets to protect the premises against insects, which strengthen over the entrance and Windows.